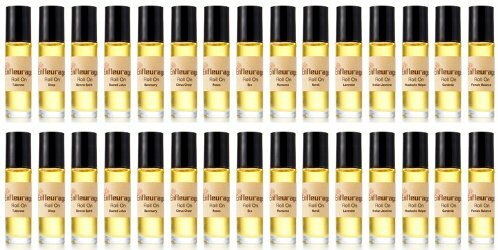 Was it really six years ago that I wrote a shopping report about Enfleurage, New York's most specialized purveyor of natural aromatics? Yes, apparently. The boutique has since moved to a new address (237 West 13 Street, in Manhattan's Chelsea neighborhood) but its staggering selection of essential oils and natural incenses remains unchanged. I still sniff individual oils during each of my visits, but I'm also very fond of Enfleurage's "house blends." They're available as concentrated oils and as "roll-ons to go," diluted in a base of organic jojoba oil for ready-to-wear use. My favorite house blend is Sanctuary, a blend of ylang ylang, chamomile, patchouli, clary sage and black pepper. A few years ago, when I was struggling through the final rewrites and edits of my doctoral dissertation, I happened to pay a call to Enfleurage and I decided to purchase something to wear and inhale for inspiration. I asked one of the staff members for a recommendation. He suggested Sanctuary as a blend that could simultaneously calm and motivate; perfect, I thought. I did finish my dissertation, thanks in part to Sanctuary, and I've since repurchased this scent. The ylang ylang and chamomile are soothing, the patchouli and clary sage are grounding, and the pepper provides a burst of energy. I've learned anecdotally that Enfleurage's owner created Sanctuary to offer a sense of emotional refuge after New York's terrorist attacks of September 11, 2001; Enfleurage doesn't specifically market Sanctuary this way (for which I respect them even more), yet it's an interesting footnote. You won't be surprised to learn that I soon went on to try Rose, a "blend of two roses" — most likely rosa centifolia sourced from Morocco and rosa damascena from Bulgaria, if Enfleurage's general list of essential oils is any indication. It's a lovely "true" rose fragrance, fresh and dewy, a bit waxy, with gentle touches of green. Like all Enfleurage's roll-ons, it could be considered either aromatherapy or natural perfume; the company doesn't set any rules. As a fragrance, it has light staying power; for a bit more "oomph" and longevity, Enfleurage's Attar of Roses — rose otto and rose absolute with sandalwood — might be just the thing. Last but not least, I can recommend Amber, Enfleurage's own secret brew of ten essential oils including benzoin, cistus, oakmoss, opoponax, Peru balsam, clove and others. It's velvety and rich, a perfect scent for late-autumn nights, and its resin notes are seamlessly interwoven with dark smoky woods, hints of vanilla and a very piquant clove. The Amber roll-on is a treat to wear, and the Amber pure oil is perfect for a cold-weather home fragrance blend. Come to think of it, I'm still not done exploring Enfleurage's complete aroma catalogue — even after all this time! — maybe because I keep looping back to these house blends. It's a good problem for a scent-lover to have. Enfleurage Sanctuary ($17), Roses ($27) and Amber ($22) are available as .35 oz. "roll-ons to go" or in other sizes (Sanctuary, for instance, is also sold in 5, 10 or 30 ml, $15-$76.50) at the Enfleurage website. I have such fond memories of this place, back when they used to be at their first location, which I think was before Bleeker Street. It was my first introduction to the oils of the middle east, and my friends and I probably bought a bunch of oils that we split up- things like spikenard and frankincense that we mixed with other (at the time) unusual oils. I remember meeting Trygve, who was lovely, and listening (enviously) to her tell us about her travels. The staff was always fun to speak to. This was way back before Oud was big here, and just at the beginning of the niche explosion. I think it was about the same time I started buying Annick Goutal and L’Artisan perfumes. Enfleurage was a place you could get the unusual stuff, at a some time reasonable price, mix it up yourself, and imagine being somewhere exotic! I’m mad that I never bought a bottle of a house blend that was called “Purple”, which I still remember longingly. Yes, Bleecker Street! I think we started shopping/exploring around the same time. Trygve is still often in and out of the boutique when she’s not traveling — I definitely spotted her on my latest visit. All the staff are knowledgeable and kind. And yes, since you can buy many of the oils in small amounts, you can potentially get a lot of scent-bang for your buck. I’ve been burning the pure oil in an electric warmer… my “home office” smells so good! and it’s lovely on skin as well. One of the longtime staff members, Joe, created this blend. This is right in my hood! I should stop by! Lucky you!! Yes, definitely go. It’s a good thing that I need to take mass transit to get there…otherwise, I’d never leave and I’d buy ALL THE OILS. I’ve practiced therapeutic aromatherapy for almost 25 years now, and I cannot imagine what Sanctuary would smell like! But I want to try it as well as Amber, which sounds wonderful. Oh, nice! You are an expert. Sanctuary always surprises and pleases me…I always have to have some on hand. As a long time lover of Opium, Fendi and Coco, their Amber perfume sounds as though it’d be perfect for my tastes. I don’t know how I haven’t visited their website before now but I think that will change very soon! What a treat on this chilly, gloomy Friday. Thank you, Jessica.